ChromeInfotech is a NASSCOM recognized 8+-year-old Web Solutions Development firm that holds its name as one of the leading AngularJS Development Firm because of the exceptional Services provided by its team of talented and experienced AngularJS Developer. So If you are an Entrepreneur interested to Hire AngularJS developer for your Web App Project, then you have landed in the right place. As an established and reputed Software Development firm, We are always intrigued to adopt new and trendy technologies into ChromeInfotech’s development pool. So much so that We made use of AngularJS in most of Our Web App Development Projects in one way or the other. And It’s not just Us. Entrepreneurs love AngularJS too. At this very moment, there are more than 350000 Web-based Solutions that are made using AngularJS. What’s more striking is the fact that some of the most loved Web Applications are also using AngularJS. Such popularity of AngularJS is the root cause behind the significant rise in demand of AngularJS Developer. Entrepreneurs are increasingly looking to Hire AngularJS Developer for their Web App Development Project. But let me tell you that it is not an easy job to Find AngularJS developer who can be the best fit for your Project. A lot of effort and time goes into the process to hire dedicated AngularJS developer . You need to do your homework and get your facts right if you want to hire top-notch and Expert AngularJS Developers . And Here’s Where We can pitch in and Help you out. As an acclaimed Web Application Development Company, We Have worked in innumerable AngularJS empowered Web app development Projects. And thanks to Our Experiences, We now have a proper Understanding of What Characterizes the Perfect AngularJS developer. At ChromeInfotech, We have Skilled Angular.JS Specialist for Hire who can transform your idea into a full-fledged and top-notch Web App. With an average experience of 5+ years, Our AngularJS Developers are well aware of the roles and responsibilities that they have towards a project. Therefore, ChromeInfotech’s AngularJS Developer team is the perfect example of the skills and characteristics that Expert AngularJs Developers should possess. In this Blog, I have penned down these aspects that will certainly help you to differentiate a GREAT AngularJS Developer from a GOOD one. What is AngularJS used for & What does AngularJS developer do ? What benefits can you get if you hire dedicated angularjs developer ? How to Hire expert AngularJS Developers for your Project? What type of Applications can an Angular front end developer build? What is the cost to hire dedicated AngularJS developers? So Let’s go ahead and look at these aspects one by one. What is AngularJS & What ChromeInfotech’s AngularJS Developer do? It is Open Sourced meaning that it is free to use. So When you Hire AngularJS Developer , His/her primary responsibility will be to build the Client-side of a Web Application. But an AngularJS developer’s role doesn’t just end at that. Our developers At ChromeInfotech are well trained and skilled to handle various tasks and responsibilities efficiently. Every Business is different, and so are their requirements. That is Why Our AngularJS developer team focuses on Creating a Customized Solution tailored exclusively for your Businesses. But also to build Brands with Our Custom AngularJS Development Services. As I mentioned before, the prime responsibility of an AngularJS Developer is to build the front-end components of a Web Application. And this is the reason Why Angular UI developer is another name given to AngularJS Developer. At ChromeInfotech, We understand the importance of possessing an appealing UI and a seamless UX. So Our developers make use of the various features and functionalities of the AngularJS framework to build beautiful Web Applications for your Business. ChromeInfotech houses a full-fledged Angular UI Developer team that develops the complete front-end of your Web App. Building User-centric Single Page Application(SPA) is What AngularJS is explicitly known for. Thanks to AngularJS, SPAs nowadays can be found everywhere. Yes, You can use other technologies for building SPAs. But nothing surpasses the in-built features and functionalities of AngularJS. Hence, making it the optimum platform for building SPAs. At ChromeInfotech, We have Skilled Angular.JS Specialist for Hire accustomed to building beautiful and high-performance SPAs. So, If SPAs is what you need for your Business, then ChromeInfotech can help you to achieve your goal. This is one of the mandatory responsibilities of an AngularJS Developer. The AngularJS Framework comes with tools that allow easy Unit testing of the complete Front-end. We have angular.js experts for hire who possesses an understanding of Unit Testing. Our AngularJs Developer team performs thorough Unit Testing of all the front-end components to ensure that there are no bugs or issues. Then you can rest assured to receive an unflawed and defectless Web-based Solution. AngularJS brings in speed and flexibility to the Web App Development Process. So, MVP Development of your Web Application can be carried out much faster with AngularJS in the picture. MVP is the most basic version of your application consisting of only the essential features. At ChromeInfotech We strongly recommend every Entrepreneur to go with an MVP first. By doing so, you can check the viability of your software Product and whether or not it turns out successful in the Market. We, At ChromeInfotech, have angularjs programmers and developers for hire who can help build an MVP within less time and money! So We can be your one-stop Source to build an MVP as well as a full-fledged AngularJS empowered Web Application. Developers are consistently releasing New and improved version of the original Angular Framework. The latest version being Angular 7-Released on October 2018. So It is not unusual for Entrepreneurs to Reach Out to an Angular development agency to migrate their already existing Angular empowered App to another version of Angular. At ChromeInfotech, We have top angularjs developers team for hire that can help you to make the jump from an older version of AngularJS to a new one. The responsibilities of an AngularJs developer extends even after the release of your Web Application. At ChromeInfotech We give equal importance to all the phases of development. And one of them is providing Post-launch Support and Maintenance. Our dedicated QA team performs testing time-to-time to detect any flaws or bugs. We have angular.js experts for hire who then fixes the issue as soon as possible. In addition to this, there’s one more perk that you can get if you hire angularJs developer from ChromeInfotech. We integrate various App Analytics tools into your App to make sure that you can monitor the performance and various other aspects of your App after its launch. So with ChromeInfotech as your tech Partner, you don’t have to stress over your Web Application’s Maintenance. We have got it covered! We house angular.js specialist who will sit down with you to help plan the development of a customized AngularJS empowered Solution. Our Angular.JS Consultant has the skills and qualification to guide you through any doubts or confusions that you may have regarding AngularJS. How Our team of Angular front end developer can help transform your idea into a User-friendly Web App with a blend of interactive features and seamless navigation. APIs are the bridge connecting the front-end of your Application to the back-end. So an angular front end developer needs to possess knowledge regarding APIs as well. So these are some of the services that you can expect from an AngularJs developer. But At ChromeInfotech Our Services are not restricted to just the above aspects. We always strive to deliver the best digital Solution to Our Clients. And if required, We can integrate emerging technologies into your Project. We hold expertise in providing IOT development Services which is one of the popular trends that’s been going around in the Digital World. This is just one of the examples of how We make Our Digital Products unique and innovative. Now, Let me brief you about Why you should Hire AngularJs developer to leverage your Business. Why ChromeInfotech recommends you to hire AngularJS Developer ? There’s no doubt that We at ChromeInfotech love working with AngularJS. And you as an Entrepreneur will love it too once you get to know about the benefits that your business can gain with AngularJS. So Here are some of the top reasons Why We recommend Entrepreneurs to Hire AngularJS Developer for their Business oriented Web Development Project. AngularJS has been able to hold its position as the most popular front-end development framework. Among its competitors are Backbone, Vue, Ember and React. If you hire AngularJS Developer , then you can expect to receive your Product at a much faster rate. Also, AngularJS is one of the 4 technologies in MEAN Stack- A full Stack JavsScript development Framework. 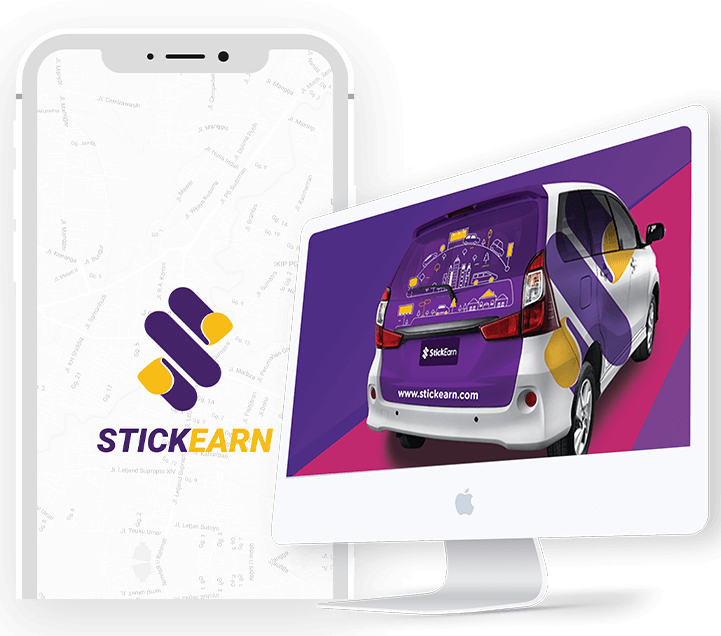 There are many advantages of MEAN Stack Application development and faster development is just one of them. This is one of the principal reasons for Why We recommend AngularJS. AngularJS is best known for building SPAs that are dynamic and engaging. AngularJS empowered SPAs provides a beautiful UI and a fast, smooth and fluid UX. So If that’s what you want, then you should go ahead and hire angularJS developer . Testing is a critical phase to ensure that your Web Application is working as expected. Usually, testing takes up a lot of time and effort. But hire AngularJS developer , and you can save up all that extra time and money. Angular comes with Dependency Injection, a feature that makes Unit testing easy for AngulartJS developer. Concerned about the security of your Web Application? Well, hire AngularJs developer and get rid of all your worries. AngularJS comes with in-built protective measures against HTML injection attacks and Cross-site scripting. So, an AngularJS developer can efficiently and quite effectively make your Web App guarded against any security threats and attacks. These are some of the top reasons Why you should Hire AngularJS Developer Programmers . Then Here’s a blog on Angular Web Development which can give you more insights about the above points. The next fragment of this blog is going to be about How to Find angularjs developer for your Project. The rise in popularity of AngularJs has also lead to an expansion in the AngularJS Developer community. With such a vast community of AngularJS Developer, It will be difficult to filter out the ones who are proficient in it. So to make this whole process more comfortable for you, I have pointed Out the aspects that define a Great AngularJS developer. I have also thrown some light upon How ChromeInfotech’s angularJS developer team fulfills all these parameters and can be the right tech partner for your Web App development Project. It goes without saying that an AngularJS developer must have complete knowledge about AngularJS. That’s the first parameter that distinguishes an excellent AngularJS Developer. And Yes, Our AngularJS developer team in ChromeInfotech holds knowledge about AngularJS out and Out. In Addition to that, Our developers are well-experienced with all the versions of Angular- From AngularJS to Angular7. So Whatever your Project’s requirement is, ChromeInfotech can make that happen. We have dedicated AngularJS Developer team who can fulfill all your needs and expectations. And this is something to keep in mind while you are looking to Hire AngularJS Developer . The more experienced a developer is, the better will be your Project. 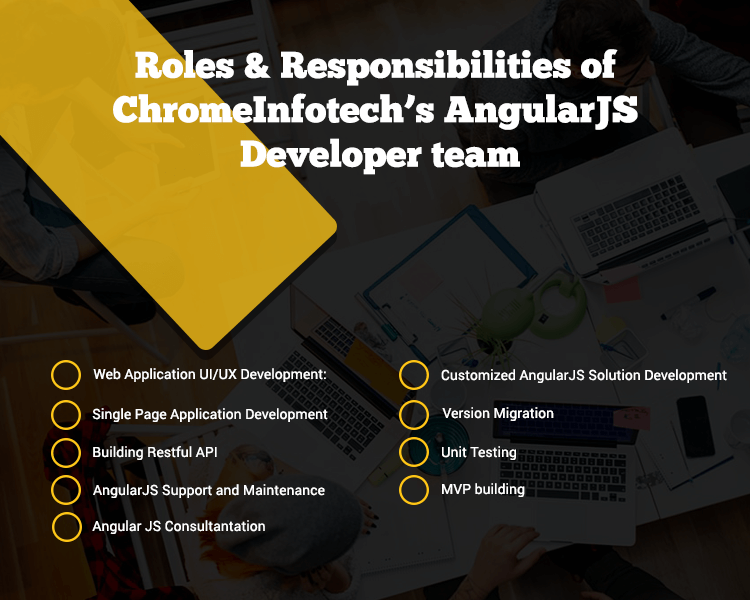 ChromeInfotech houses skilled AngularJS Developers with an average experience of 5+ years. Moreover, We have a long history of associating with successful AngularJS Projects spanning across 17+ industry segments. Here’s one such successful AngularJS Web development Project that went to receive Million Dollar Funding! Check Out the complete case study Here to know about the Project in details. So, Hire AngularJS Developer from ChromeInfotech and watch your Idea get transformed into a fully functioning Web Application without any trouble. And that’s Why Our developers can write codes in AngularJS effectively. HTML and CSS are two terms that often come up when you talk about front-end development. These are the building blocks for developing a Web Application. In fact No HTML and CSS= No Web Development. At ChromeInfotech, We believe that a solid foundation is a secret to a powerful Web Application. And That’s Why We make sure that all Our AngularJS Developers are proficient in both HTML and CSS. AngularJS is all about Front-end development. So Why should you hire angularJS developer who knows back-end development? Yes, I agree that AngularJs has nothing to do with server-side development. But we at chromeInfotech believe that having just a basic understanding of back-end development is essential for every AngularJS Developer. And This is something that we have learned from Our experiences. Each of Our AngularJS developer is aware of at least the fundamentals of back-end technologies, mostly Node.js. This leads to smooth coordination between the back-end and the front-end development teams. And Hence, efficient development of your Web Application. So We don’t have to tackle through any inconvenience or unnecessary loss of time brought upon by unparalleled coordination. You are halfway down the road of developing your Web App, and something goes wrong. Now the last thing that you will want is to start again from the beginning. So To prevent Our Client’s from facing such situations, We ensure Our AngularJS Developers are skilled in Version Control. Version Control is the process that lets you store and track any changes in the source code. We can go back to a previous version of Our work, track down the issue and fix it without having to start over from the beginning. Our developers have years of experience working with leading Version Control Systems like GIT and SVM. AngularJS is already making Web Development a lot Easier and Simpler with its inbuilt components and functionalities. But developers are not stopping at that. They are coming up with various AngularJS supporting Frameworks that are further simplifying Web Application Development. ChromeInfotech’s team of new-age AngularJS Developer is well-versed with all the popular AngularJS Frameworks. Depending on your requirements, Our developers make use of the appropriate Framework to efficiently transform complex and large scale Projects into state-of-the-art Web Applications. Using these frameworks, Our Developers can ease Out your Stress and efficiently carry Out the development of any Web App based Project. The days are long gone when desktops or laptops were the only modes of viewing a Web Application. Nowadays, Users spend more time surfing the Web on their mobile phones and Tablets. So what you need is a Web Application whose pages adjust to devices with different screen sizes. And to deliver such Solutions Our AngularJS Developer team employs Responsive Design. Responsive design is what makes Web Applications look appealing on various devices. Therefore, ChromeInfotech’s team of AngularJS Developer is familiar to the principles and working of responsive design. So if you hire AngularJs Developer from Us, then you can rest assured to obtain a responsive Web Application that Users can view from any digital device. Testing is a crucial phase that you need to take care of along the way. That’s because it is through testing that you can come to know if there are any issues or bugs in your Web Application. So every one of Our AngularJS Developer team is skilled with the various tools and techniques of Testing as well as Debugging. We adopt various types of testing methods. Functional Testing and Unit Testing are two such methods that Our Developers are frequently concerned with. Soft Skills are something that is universal to any profession. And this implies to Development too. If you hire AngularJS Developer with excellent technical skills but poor soft skills, then it may affect the efficiency of the development process. But an angularJs developer with the perfect soft sills can bring Out the best out of any Project. He/she can steer the Project in the right direction by bringing in efficiency into the development process. There are two Approaches to Web App Development: Traditional and Agile Methodology. Here at ChromeInfotech, We adopt Agile Software development for each of Our Project. The below image shows how Agile development is beneficial as compared to Traditional development. 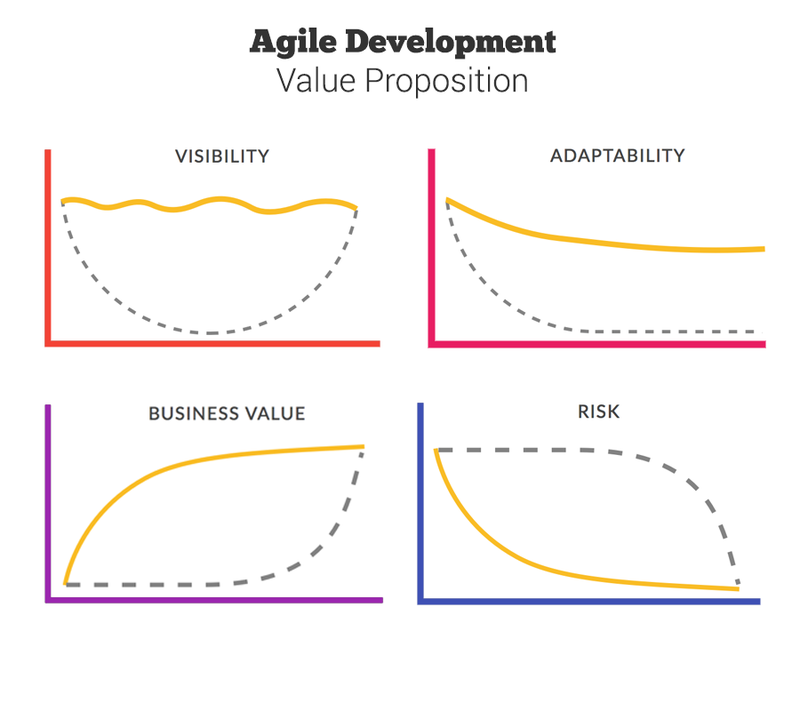 In the above image, Agile is denoted by the yellow line while the dashed line represents traditional development. Now as you can see Agile clearly holds more advantage than other methods. And this is the reason Why all of Our AngularJs Developers hold experience in Agile Software Development. Our AngularJS Developer team can make use of Agile development to efficiently manage each phase of the development process. Hence, resulting in a sophisticated Web Application. You do have the option to outsource your Project to a Freelancer AngularJS developer. But a freelancer AngularJs developer won’t provide you the commitment that you can gain from a professional Web Development Company. Right from MVP development to providing Post-launch support and Maintenance, We provide all-inclusive AngularJS Development Services. At ChromeInfotech, We won’t cut short or break off in the middle of the Project. We provide full commitment and dedication to every Project. Our experienced angularJS developers put their focus on first understanding your ideas and your business needs. They then shape up customized AngularJS empowered Solution that meets all your Project requirements. Teamwork is Our Strength. And it is through Team Work that We have the means to come up with innovative solutions to build Great Web Applications. We house a team that is dedicated solely to communicate with Our Clients. They keep you updated with all the ongoing tasks and activities and also reverts to your queries at the earliest. So these are some of the essential aspects that you might not expect to receive from a freelancer developer. Single Page Applications are what AngularJS is best used for. These SPAs are fast, engaging and are the best fit for real-time updates and communications. SPAs are characterized as the new Age Modern Web App. So if you want to keep up with the trend, then Hire AngularJS developer now! As you can See there are no specific industry verticals that mainly use AngularJS. Then AngularJS is for you. At ChromeInfotech, Our AngularJS Developer team shape up Web Applications adorning a beautiful and engaging UI. Our AngularJs developer team holds expertise in developing Applications belonging to various Industry verticals. And one of them is Entertainment. By using AngularJs, Our developers can shape up Video Streaming Web Applications that are responsive and dynamic. Netflix and the Youtube Application for PS3 are two of the leading Video Streaming Applications using AngularJS. E-commerce/ M-Commerce are two of the industry domains that We frequently associate with. We have used AngularJS to deliver innovative E-commerce and M-commerce Apps that has turned Out to be successful. Two things mainly affect the success rate of such Apps: Speed and Its UX. Higher speed and a seamless UX is what attracts users to these types of Web Apps. So Our AngularJs developer team leverages the components of Angular Js to build SPAs that are User-friendly with fast loading time. 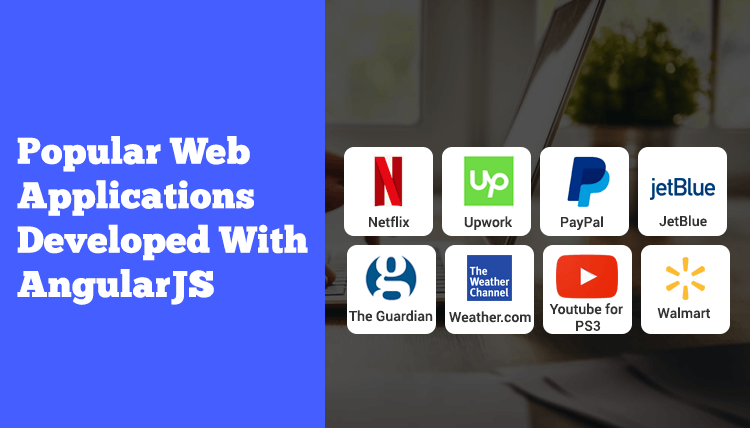 PayPal, Upwork and Walmart are just a handful of such Web Applications that are using AngularJS. The Travel Industry is continuously expanding and is now adopting new technologies to reach Out to Users. And most of them included AngularJS as one of the technology. We Use AngularJs to build dynamic and engaging Web Apps that are sure to captivate Users. JetBlue, a leading Travel based Web Application is made using AngularJS. The above examples represent just a few categories of Applications We can build using AngularJS. But if you want to get a detailed analysis of whether or not AngularJS is the best fit for your Project, then you can reach Out to Us at ChromeInfo Technologies. How much does it cost to hire AngularJS Developer ? What is the cost to hire angularjs developer programmers ? Yes, I agree that Cost is one of the crucial factors required to hire AngularJs developer . But Sadly, there is no single or definitive answer to that. However, there are certain aspects which can help you to draft out a rough estimation. Then you must first go through the above parameters and figure out your requirements. Yes, it will require you to invest in a lot of time and effort to Hire AngularJS Developer . But nothing goes in vain once you get hold of the right AngularJS developer. With an AngularJS developer that fits perfectly into your Project requirements, everything will turn Out as expected. There are certain aspects that differentiate an expert AngularJS developer from an average one. And I hope that I have been able to convey these parameters to you through this blog successfully. If you have found this blog helpful, then please do leave your feedback in the comment section Below. With 95% of Existing Businesses going digital, 2019 is the right time to invest in an AngularJS empowered Web Development Project. And ChromeInfotech’s AngularJS developers possess all of the qualities and skills that characterize an Expert AngularJS developer. So If your business requires an AngularJS based Web Application, then simply reach Out to Us. Our team will get back to you and set up a session to help transform your idea into a full-fledged Reality!